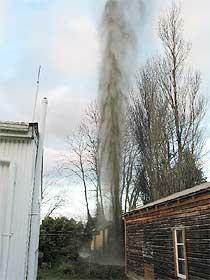 The concept of an eye-catching water feature took on a new slant for Shaun Payne when a 25-metre geyser blew its stack in his back garden near Lake Taupo. Mr Payne, who has lived in Tokaanu village at the southern end of Lake Taupo for just over a year, said the day began as normal. He said he was having a cup of tea with a friend about 9.30 AM yesterday morning when he heard a loud rumbling noise. "There's an 80-year-old bore in the back garden we use to pump hot water into our hot pool and you can always hear the water there but just as my friend, Ian, went to look down it the water just shot up like a gusher and he only just got out of the way." Mr Payne said the fearsome jet of boiling water shot 25 metres into the air and started raining stones, some as big as a man's fist, on to the house. About five houses were also caked in mud. "I'm a fifth-generation Kiwi and I have never seen anything like it, there was just a massive force underneath." Last night the gusher was still spouting boiling water high into the night sky with no let up in sight. "Someone told me there was one that went for 60 days once and then just stopped all of a sudden. This one has been going full blast all day and it doesn't look like it's going to stop. "It's kind of a tourist attraction and we have had all sorts of people stopping to have a look, but it is a bit of a worry and I wouldn't mind if it stopped now." Though specialists were being called in today to try and deal with the geyser, Mr Payne said he had been told to keep a careful ear on events during the night and to evacuate if the rumbling and trembling under the house got any worse.